Ok so the rumors were true for the most part it seems. 🙂 A new camera in the Xdcam line up has been released by Sony, the PMW-200. 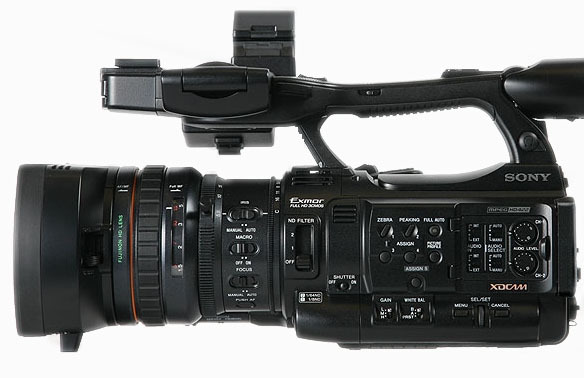 It is a camera that seems to build on the XDCam EX line in body shape and lens choice. It will feature 3 Exmor Full HD CMOS sensors, each sensor having 2 million effective pixels, which will allow shooting a 1080 full raster HD image without pixel interpolation. Very cool. This camera also adds something I really really wish our Sony F3 had, a 50Mbps image using the solid MPEG HD422 compression. Why is this a big deal? Well because EBU and BBC for example have set the 50 Mbps bitrate limit as an “acceptable” quality for other things than news. (Although bitrate is not everything, not all 50mbps cameras are automatically approved ie PMW-100) The F3 may have a great looking 35Mbps image but will require an external recorder capturing atleast 50mbps images to comply with high end broadcasters. I can only hope, now that this camera is “out of the bag” Sony will decide up allow for an upgrade on the Sony F3. 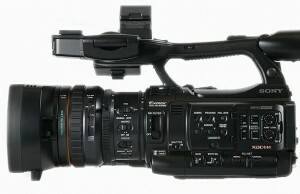 The PMW-200 will, like the EX1, use the SxS cards both the PRO and SxS1 cards. The new twist is that by formatting the cards in UDF (Universal Disk Format) you can now record in and industry standard MXF file, also very cool. You can still use the MP4 files using FAT32 formatted cards. It will shoot all flavors of HD as well as SD DVCam. On Sony’s site it says “(Note: Proxy video is not available with the PMW-200).” I think the proxy files associated with each master clip on the XDCam 700 and 800 is a great way to log, and transcribe footage and if this feature is not available on the PMW-200 I think that is a shame. I don’t know how accurate the PDF User manual is that I got the other day, so we’ll wait until Sony release an official one on their site, to read more into all the features and specs. But what specs we know for sure, the new 1/2 inch sensors, built in ND filters, HD/SD-SDI output, Slow & Quick motion, 14x zoom lens, 4 Hypergammas, 15 sec cache record, genlock and TC interface this could prove to be a great little camera. It is priced just under 8k. Here is the Sony Site.